As universities across the US tout record application numbers and record-low admissions rates, college admissions seem to get more and more competitive. That means more and more is expected of high school students looking to gain admission to the nation’s most competitive universities. With so many students earning GPAs well over 4.0 and SAT scores over 1500, it can be difficult for admissions officers and interviewers to distinguish between one elite candidate and another. One of the primary ways candidates stand out among an elite pack is through their extracurricular activities lists. 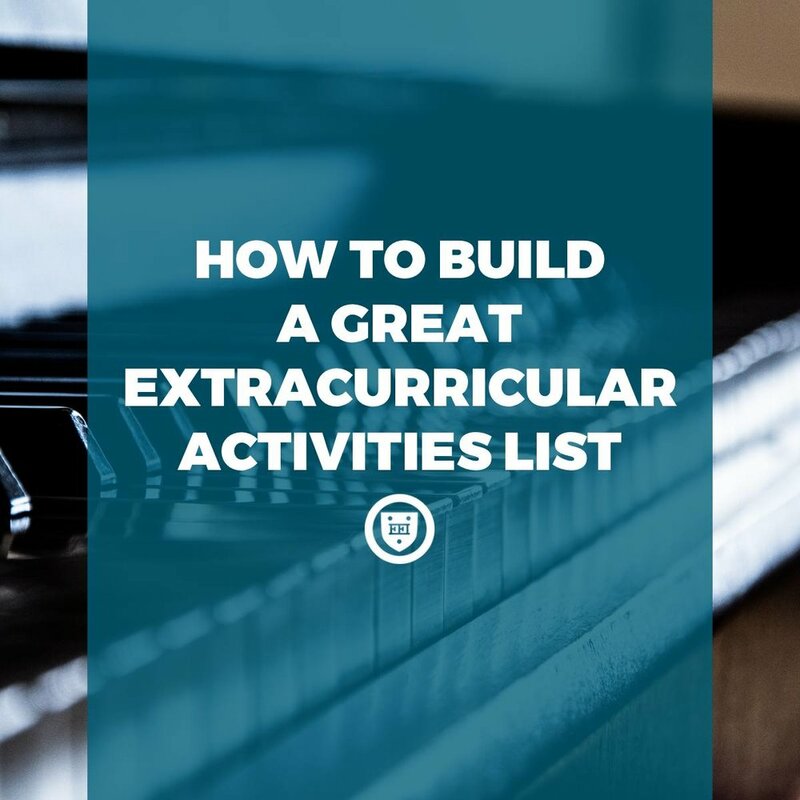 When building your activities list, keep in mind that “activities” means more than school clubs and organizations. Activities can include a job outside of school, a passion project you’ve been working on independently, or even a family obligation, such as taking care of your siblings. Transcripts are records of your time spent in school; the activities list are records of your time spent outside of school. If you’ve done something meaningful outside of school hours—for your own personal development or for others—then you should consider including it in your activities list. So, how do you build an activities list that will stand out? Admissions officers are not impressed that you spent three hours one week volunteering at a nearby nursing home. They are also not moved by the fact that you attended monthly one-hour meetings for your school’s video game club. Of course, you should volunteer, even if it does not demand a significant time commitment. And yes, attend those monthly meetings. Depending on how much you’ve done outside of school, you might want to include one-time volunteer work or minor engagement with a school organization, but neither of these should be at the top of your list. Admissions officers are impressed with sustained engagement. Your activities list should communicate passion and commitment. What is most important is that you list activities that demand several hours of commitment each week, and that you have kept up with that commitment for the long haul—the longer, the better. Practiced the piano five hours a week since eighth grade? Get credit for all that work here. The time you spent in high school is the raw material for making a compelling case for why you belong at the school of your dreams. It is going to take commitment and passion to be a meaningful contributor to a university community. By demonstrating long-term commitment to activities you are passionate for, especially activities with social merit, you show admissions officers that you’re capable of bringing that energy to their university. There is an art to being an effective follower, and most universities do, or at least should, value that kind of work. But most universities also put a premium on leadership. In addition to demonstrating that you are committed and passionate, you need to show that you are capable of leading a group and of bringing people together to accomplish an important task. This means being president of a club or captain of a team. It can also means taking initiative by starting a club or group that wasn’t there before you arrived. It is also worth noting that leadership is not limited to schools or outside organizations. If you take a leadership role at home—with your family business, or by taking care of your siblings—it is important that you gain recognition for this work, too. Make sure to include any meaningful task that has demanded your time. As with recommendation letters, the best activities lists are “specific and storied.” That is, your activities list needs to be detailed, with strong action verbs. Your activities list needs to give narrative shape to you as an accomplished individual with a world of potential. Who are you? That’s what admissions officers want to know. Your friends and family might know your essential self, independent of your actions today or yesterday. But admissions officers will only know you by how you’ve spent your time. In order to be specific and storied, focus on describing your activities with strong action verbs. Take these descriptions of the same activity. Which is better? Held weekly meetings to discuss and practice chess. Oversaw weekly meetings to develop strategies; coordinated practices of ten to fifteen members to hone skills. The first tells it like it is, but the second shows us much more. Why is the second stronger? “Oversaw” implies action and direction, whereas “held” feels more passive. “Coordinated” reveals an act that the first one conceals: this student had to make announcements, recruit new club members, and follow up with the existing members, but all that work gets lost in the vague description of the first listing. “Hone skills” digs into the purpose of these meetings, whereas “discuss” fails to reveal that purpose. In order to tell the admissions committee who you are, use action verbs to show them what you’ve done. Refer to this list for examples of action phrases and action verbs that can separate your activities list from others. Need a hand with college apps? With Elite Prep’s College Application Services, you’ll work with an experienced counselor and mentor to craft a winning college-application package that shines a light on exactly who you are and what you’ve achieved. Schedule a free consultation today! Are Some SAT Test Dates Easier Than Others?